Wallace's Hut, near Falls Creek, is one of 106 huts scattered across the Alpine National Park. Many of these huts were burnt in the 2003 Alpine fires but fortunately Wallace's Hut survived. Built in 1889 by the Wallace brothers (Arthur, William and Stewart), this hut is one of the oldest mountain huts in the Alpine National Park. It is set in a lovely shaded area which is a good spot for a picnic or a rest stop. This image belongs to the travel and nature stock photo library. This stock photo of Wallace's Hut is available for licensing for commercial and editorial uses including websites, blogs, books, magazines, brochures and advertising. Restrictions may apply for images which contain third party copyrighted material or sensitive subjects. Photos of artwork are for editorial use only. 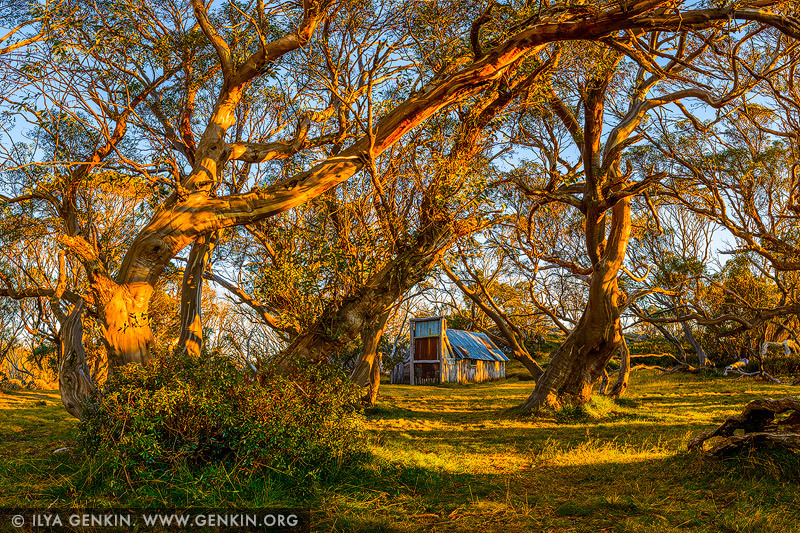 This image id AU-FALLS-CREEK-WALLACES-HUT-0001 of Wallace's Hut, is copyrighted © by Ilya Genkin. This is not a public domain image.